Today is the summer solstice, the longest day of the year, and the start of summer in the Northern Hemisphere, at least from the astronomer’s point of view. 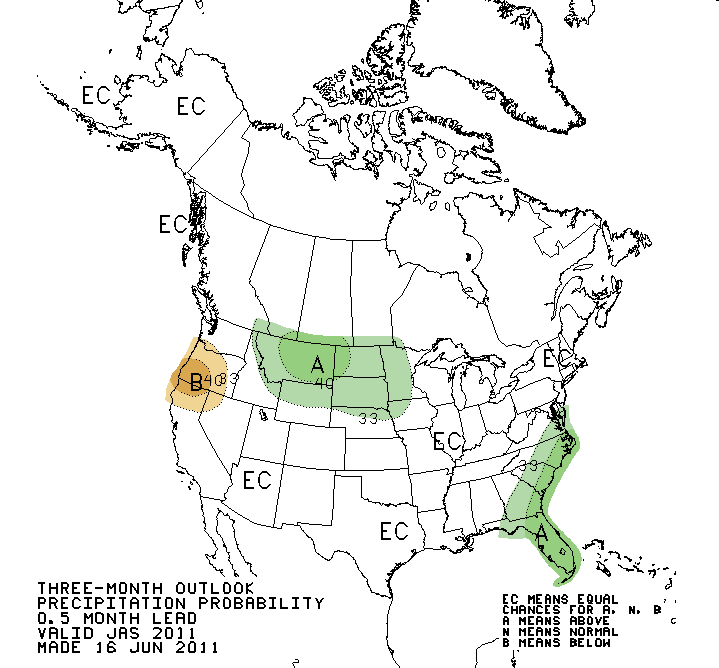 From the climatologist’s perspective, the start of summer is a little more subjective, but the months of June, July and August are generally accepted as defining summer. Does this hold in Alaska? Yes and no (you knew it could not be so simple). In most of Alaska, the nicest summer-like weather tends to come more in the early part of the summer and even before "official" summer starts. Savvy Alaskans take advantage of this, as do most school districts here, letting kids out of class earlier in the spring. Down south (the Lower 48 states) certainly has more of a "spring," but summer comes on quicker and in some cases earlier in Alaska. Let’s compare some Alaskan towns with Seattle (we compare lots of things to Seattle). You can see how May brought more 70+ days at each the Alaskan stations shown than at Seattle, even at Bettles, north of the arctic circle. Now 3 weeks into June, Seattle is warming up while none of the Alaskan stations have yet to exceeded the May 70F tally. So far I am referring to the interior and the south and southeast coasts. The Aleutian and Bering Sea Islands, and the west and North coastal areas warm up much slower due to the cold ocean waters. The Aleutians are about a month behind the rest of the state in the pace of spring warming, even though the entire chain lies farther south than the southernmost part of the southeast Panhandle. It is really quite dramatic. 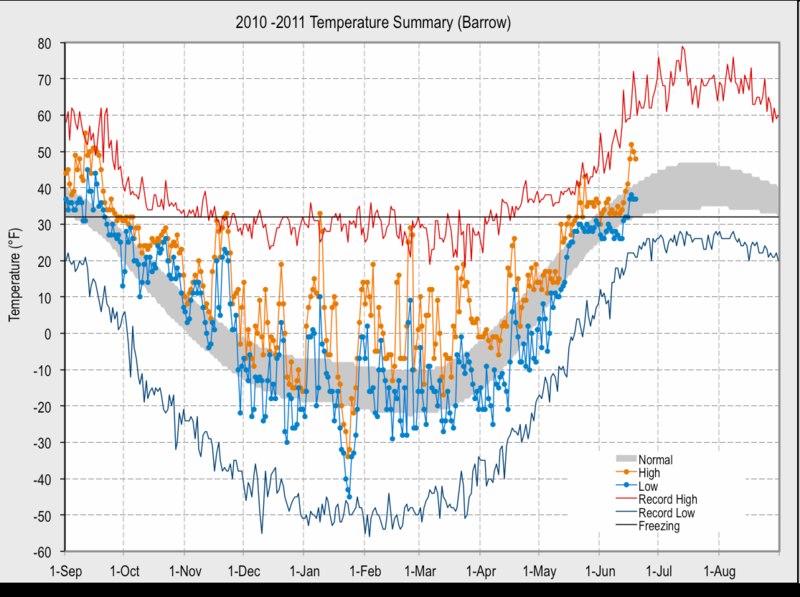 The north slope—Wainwright, Barrow, Prudhoe Bay, Kaktovik, etc—are so cold overall that despite the large increase in temperatures since mid winter, nothing remotely resembling summer can really happen until about now, mid June, and by mid August it’s all over. Let’s look at some graphs, arranged north to south, showing both the averages and what’s happened so far: (note: each graph is a little different, but they show the same thing. 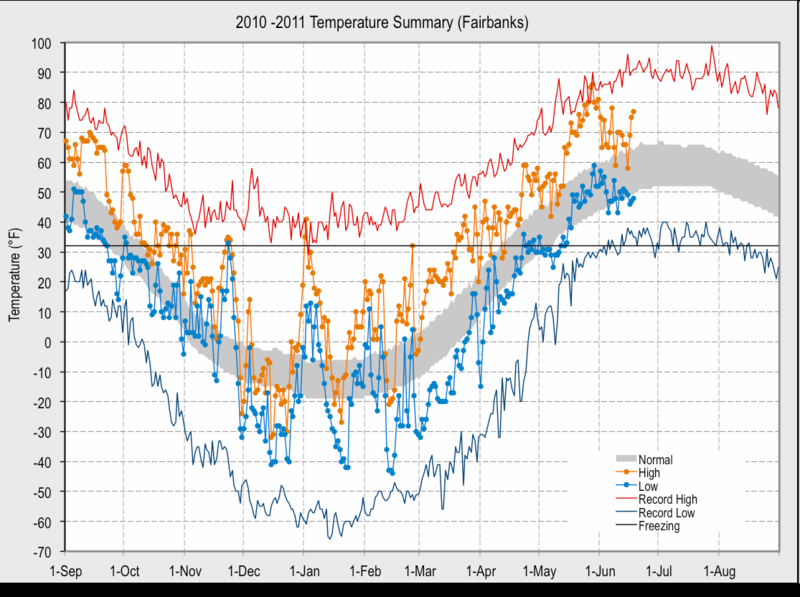 The first two look similar, but the temperature scale for Fairbanks covers a wider range.) 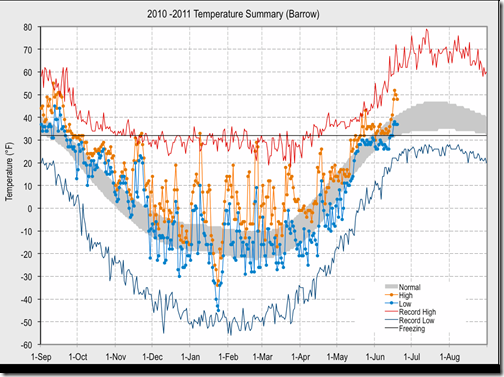 See how both the records (top line) and this year’s traces have quickly rising spikes of high temperature in May and early June that flatten as they approach the warmest average period of the year. What about the rest of the summer? As mentioned above, most of Alaska experiences the best weather early in the spring-summer. Climatologically speaking, average temperatures keep rising till mid July at most places, although high temperatures and records don’t go up much. However, cloudiness and precipitation increase after June, slowly at first then more rapidly into the fall. This fits what we’ve seen above with the nice warm sunny weather favoring early summer. The cloudier weather limits high temperatures, but also keeps nighttime lows from dropping as much. So daily average temperatures (average of the daily high and low) show a more optimistic picture for mid-late summer than just looking at highs. But what about this year? 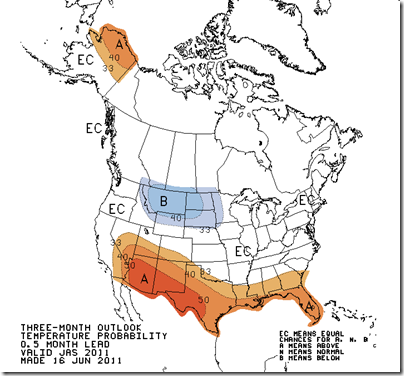 Below are the Climate Prediction Center’s July-September forecast maps. They’re saying there’s a fairly strong probability of above average temperatures for the northern interior and north slope, but beyond that, they’re not saying. Nothing statistically significant coming out of their models to indicate above or below normal for temperature or precipitation. This is not surprising since in summer, variations from average are smaller than in winter and don’t seem to correlate very well with climate forcing such as El Niño/La Niña and the PDO. However, with the PDO in the cool phase and a La Niña winter just ending I would tend to lean toward a normal to cooler than normal summer for most of the state. This is consistent with the previous few summers and what we’ve had so far this summer. How do you define summer? What kind of July and August do you think we’ll have? I’d love to hear your thoughts on these or other questions. Please leave a comment via the comment link below. A Dry 4th of July?